Angela “Angie” Drake is a 43-year-old freelance writer living in Quito, Ecuador. She was born and raised in Illinois, USA. Mrs. Drake moved to Quito due to her husband’s job, as he works in the American embassy in Ecuador. Presently, Mrs. Drake has lived in Ecuador for over a year and enjoys the country for its diversity of wildlife and local cultures. “There is a great respect for tradition of all kinds and it’s wonderful to share those with the local populace,” she observed. Mrs. Drake also said that her most difficult experience as an expat involved interacting with other expatriates who have not done any research when it comes to learning the culture of the country they are living in. “I have stood in line behind people who try to speak louder but still in English because they are certain that the person on the other side of the counter studied English in school and should understand them,” she said. Mrs. Drake advised other expats living in the country to be open-minded. “Learn enough of the language to at least be polite. Learn more of the language to better know the people and culture around you,” she said. It’s a must for people who are planning to relocate to do some research on the culture and customs of the country they plan to move to. One way to learn more about other countries is by visiting their nearest embassies or by looking for country-specific clubs and associations where people can meet locals and learn more about their culture. Doing some additional research can help expats familiarize with what life is like living overseas. Additionally, they will know what cultural norms are accepted before they make the big move. Find out more about Angela Drake’s experiences in Ecuador in her full interview below. A: I am originally from the United States. I have lived all over from an early age and the questions of origins beyond being American are complicated. I’ve actually written about it on my blog (http://www.notyouraverageamerican.com/2013/04/16/so-wheres-home/) in an attempt to explain exactly where “home” is. Q: What made you move out of your home country? Q: How did you come to choose this new country of residence? Q: How long have you been living in Ecuador? A: Over a year! We love it. Q: What has been the most difficult experience you've had when you were new in your host country? A: We are currently living at high altitude and the adjustment has taken time. It does not help that when we leave to visit lower altitudes, especially sea level cities along the coast, we have to experience high altitude adaptation all over again. We are very familiar with the headaches and have learned to drink much more water than we ever have before and with stomach issues. Small meals and gentle food like soups help with the transition. Q: Would you say that formalities like getting visas or work permits and international health insurance was particularly difficult in your host country? What was your experience with these? A: Because my husband works for the American Embassy, these were not issues. Most expats, however, have found Ecuador to be very welcoming. Though getting visas is a bureaucratic process not much different from any other country, it sounds like the hoops to jump through are not overly complicated. Q: Are you living alone or with your family? A: Our life has been one of moving and we have adjusted to living in Ecuador just fine. We love discovering new cultures, learning new languages, and sharing new experiences with new found friends. A love of learning or a sense of discovery is important to succeeding as a foreigner in a new country. Q: Was it easy making friends and meeting people? Do you mainly socialize with other expats in Ecuador? How did you manage to find a social circle in Ecuador? A: We belong to Expat groups on Facebook but rarely meet with other expats. We tend to socialize with Ecuadorians or with friends from my husband’s work. Q: What are the best things to do in the area? Anything to recommend to future expats? A: There are so many to suggest that it is almost overwhelming. 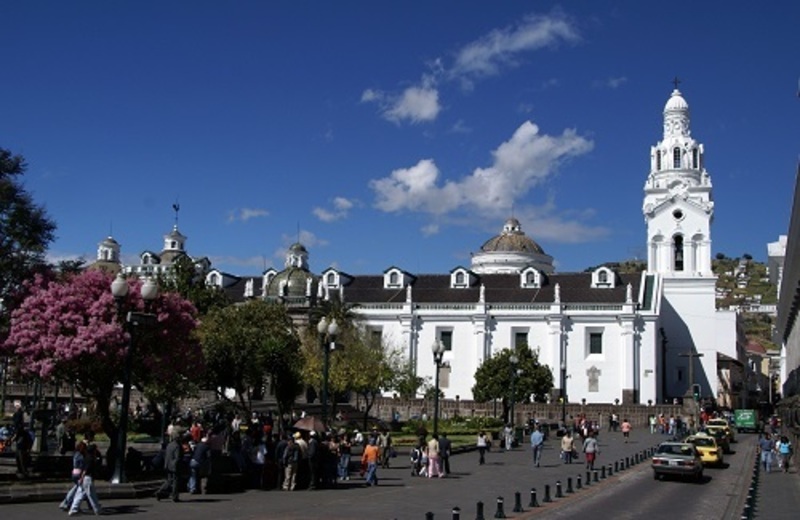 Quito is a big city with a colonial past, so the history is amazing in itself. There are great museums, churches that are hundreds of years old, cobblestone streets, and monasteries open for tours. Pre-Columbian ruins sit just on the shoulders of the city itself and there are museums dedicated to finds from Incan and pre-Incan cultures. If you are an adventurous type rather than a culture hound, hiking and mountain climbing opportunities abound. Bird watching is extremely popular and there are multiple birding habitats just a short distance from the city. The truth is, everyone could find something to enjoy in and around Quito. Q: How does the cost of living in Ecuador compared to your home? A: A cup of coffee costs 50 cents to $3.00, depending on whether you go to a small local shop serving instant coffee (common) or a Starbucks like equivalent. A meal in an inexpensive restaurant can cost $5 or less, for a full meal that includes fresh fruit juice, soup, a main dish with sides, and a small dessert. You can pay European and American prices at many places. We just went to have hamburgers at a recommended restaurant they cost about $14 a piece, two sides included. A bottle of wine can be as cheap as $8 in the grocery store but as expensive as you like. In a restaurant, an inexpensive bottle of wine is $20. For cigarettes, you can buy cigarettes one at a time on the street. Q: How do you find the local culture and people in your host country? A: The local culture is extremely diverse. Quito attracts people from all over Ecuador and many who chose to live here still try to retain the culture of their home towns. Everyone has been helpful and kind though it does help that we speak Spanish and can communicate with locals in their own language. Ecuadorians smile less than Americans but always respond positively to our friendly overtures. Overall, I would say we have been welcomed with open arms. Q: What do you think are the positive and negative sides of living in Ecuador? A: The negatives are that poverty is common and the truth is that the affordable cost of living for expats comes only because of it. The cost of food and most goods are inexpensive. Items that do cost a lot are very often imported and reflect the higher wages of other countries. Many parts of Ecuador are ugly. We see pictures of gorgeous colonial buildings and stunning national parks but in between, where the average Ecuadorian lives, there are neighborhoods filled with trash, makeshift dumps on the side of the road, burning piles of garbage, graffiti of the type that could never be mistaken for art, and tall cement walls topped with broken glass around practically every home in the country. Everyday Ecuador is not always beautiful. The positives are that Ecuador has managed to preserve many of its natural spaces. Diversity of wildlife, especially birds, is spectacular. The average Ecuadorian seems to understand the importance of saving the wildlife and the wild spaces. This doesn’t always translate into protection but it certainly does help. The diversity of cultures is amazing. Ecuador is known for three basic regions, The Sierra, The Coast, and the Jungle; in each, it is possible to meet different people who wear different traditional clothing, eat different traditional foods and use different traditional medicines. There is a great respect for tradition of all kinds and it’s wonderful to share those with the local populace. Q: Do you miss home and family sometimes? A: Of course. Living away from family very hard and there are times I wish I could just walk over to my mother’s house to share a cup of tea. Q: How do you cope with homesickness? A: Modern technology helps the most. We use the computer as a telephone and are able to call home for free. We use Facebook to share photos and small tidbits about daily life. And my blog hopefully helps my family and friends back in the States better understand our life here. A: We will definitely move for my husband’s job. Whether we return to the United States or get to live in another country remains to be seen! Q: What has been the hardest aspect to your expat experience so far? A: Visitors to this country who haven’t done their homework. I have stood in line behind people who try to speak louder but still in English because they are certain that the person on the other side of the counter studied English in school and should understand them. I’ve read TripAdvisor reviews where a tourist gets angry because a local restaurant offered them chicken when they said they don’t eat meat. But just a little understanding of the language would help them realize that chicken isn’t meat here. If you are a vegetarian, you need to say that you eat only vegetables or that you eat no animal flesh whatsoever. Saying you don’t eat meat only means that chicken and guinea pig and fish are all things you might be offered. And many people come here and have a list of things they want to fix. Granted, Ecuador is far from a perfect country but it is a country with proud people who can fix their own problems. There is nothing wrong with helping but it needs to be done on Ecuadorian terms and in partnership with local communities. Q: What tips can you give other expats living in that country? Q: Do you have favourite websites or blogs about your host country?